Hong Leong Cardmembers: Get FREE RM15 Dealmates credit upon registration as new DealMates member! Good news to all Hong Leong Cardmembers! 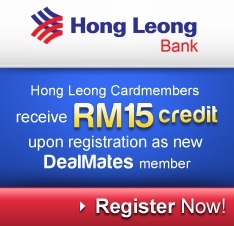 All Hong Leong Cardmembers gets RM15 credit upon registration as new DealMates member! What's more, you also get an additional 5% discount on ALL DEALS!